Did you know, as a volunteer firefighter in the Vestal Fire Department, that all your required training is provided to you free of charge? All your Personal Protective Equipment (PPE) is also provided to you free of charge. There are many scholarship opportunity’s available to volunteer firefighters. This is a great opportunity to help fund your education in a career field you choose! There have been many members that have used this as a stepping stone to pursue their careers in the field of Firefighting, Fire investigation, Fire prevention, Homeland Security, code enforcement, Law enforcement, First Responder Dispatcher, not only at the local level, but at the state level and beyond. Some of our required training includes federal required incident management training that you could take with you in any of these fields. Some of our volunteers have careers in these fields, and would be a good source of information, if you are thinking about a career in any of the above. New York State provides a Tax Credit of $200 to those who are active in a volunteer Fire Department. The Volunteer Firemen’s Benefit law provides coverage to the volunteer firefighter that includes Medical and Lost Wages for any Line of Duty injury. There are several incentive programs within the Vestal Fire Department. 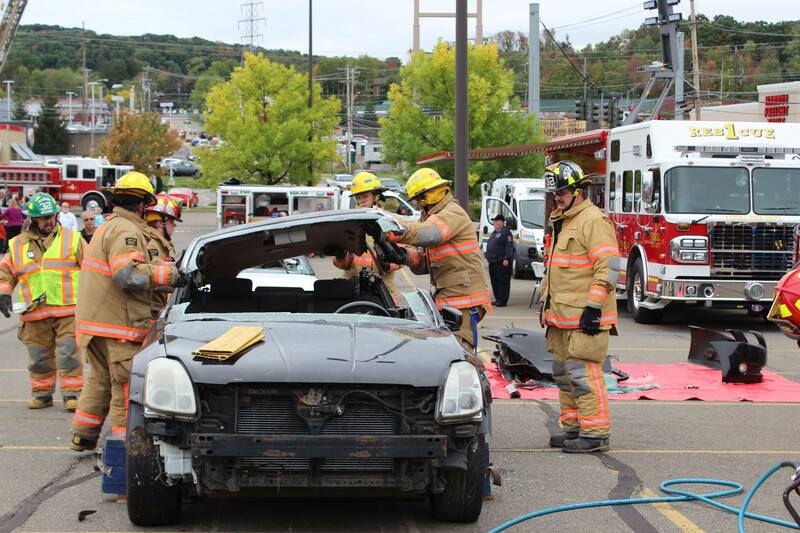 The Vestal Fire Department participates in the LOSAP program. After certain requirements are met, and if you stay and maintain an Active status year to year, there is a monthly monetary compensation that you receive after you reach the age of 65 based upon the Active Years of service you provided. The Department also provides rewards based upon years of service throughout your career. Probably the biggest benefit is knowing that you have given back to your community as a volunteer. Brotherhood and Sisterhood, it is real, we are one big family! You will develop many new friendships throughout your career! “I want to help my community”, “I want to serve my town”, and “I want to help people”. Members are provided a medical physical at certain interval years based upon your age, the expense is paid by the fire department. All results are returned back to you with any findings that you may need to follow up on. Must enjoy working under strenuous, unpredictable conditions, in all types of weather, and be willing to report for work at any hour of the day or night. We offer no pay, but will provide all the necessary equipment, free training, and a retirement plan for qualifying members. Applicants must be at least 16 years old and live or work in the Town of Vestal. Applications accepted every Monday at 9am and 7pm at the Vestal Fire Station nearest you. The purpose of this page is to provide you, the prospective member, with a step-by-step list of the procedures that a person seeking to join the Vestal Fire Department should be prepared to go through. While every effort has been made to include, at the time this was posted, all the steps required, more recent changes in the procedure may not be listed here. These changes will be relayed to the you at the time an application is turned in. It should also be noted that the Town of Vestal does not discriminate in any way against any applicant for town employment, including membership in the Vestal Volunteer Fire Department. Keeping in mind that firefighting is one of the most strenuous jobs in the world today, you should be prepared to sustain the rigors of firefighting. It requires a healthy, physically fit body and a clear thinking mind. Persons with alcohol and/or drug dependencies should think twice before attempting to do the dangerous job of firefighting. The following is the list of the steps required to enter into the Vestal Volunteer Fire Department. They are more or less in order, but items may be omitted or added as situations warrant. Station # 1 is located in the Four Corners area, on Main Street just north of the Vestal Parkway. Station # 2 is located in Vestal Center on State Route 26. It is just south of the intersection of Powderhouse Road and Route 26. Station # 3 is located in Ross Corners, in the western end of the town, on Old Owego Road. Station # 4 is located in the east end of town on the corner of the Vestal Parkway East and Earl Road. The Vestal Fire Department holds weekly practice and, or meetings on Monday nights. It also has training for day fire fighters on Monday mornings, starting at 9am. These times would be the best times to visit the station and obtain the application form. You may wish to stay on that night to view the fire fighters performing the various maintenance tasks required to keep the trucks and equipment in top operating condition. They will then go out of the station for training or stay at the station for classroom studies. Forms may be filled out on the first visit or filled out and returned at a later date. The Vestal Volunteer Fire Department has a "Company Meeting" in each of the four stations on the first Monday of each month. This is an open business meeting for all station members to discuss the running of the station and to deal with the financial and operating obligations of each respective station. While the Vestal Volunteer Fire Department is made up of the collective group of the four stations, each station is responsible for its own book work and the running of their station. It, in turn, gets its orders from the governing body of the Vestal Fire Department, the Fire Advisory Board. On the first Monday night of the month, the Company Meeting night, you will be expected to appear in person to attend the meeting and to turn in the filled out application for processing. The application form will be read out loud in front of the membership body of the station. You will be then asked to stand and be recognized by the membership. This is done, not to embarrass you, but so that all members can put a face with the name on the application form. You should make every attempt to visit the station for Monday trainings. This will give you a chance to learn more about the workings of the department and give the membership the opportunity to get to know you better before a formal vote is taken. These visits also make it clear to all members that you are serious about joining the Fire Department. It should be noted that while the application form is "tabled" by the station, it will actually be transferred to the Fire Department Administrative Office for processing. The applicant will be run through a background and arson check to see if you have any prior record that would interfere in the duties of a Volunteer Fire Fighter. After the application background checks have been completed, at the following company meeting the station membership will vote on whether or not to accept you as a new member. Voting is done by a show of hands, and you shall be asked to leave the meeting room while the vote is carried out. While this may seem intimidating, it is done to assure an unbiased vote from the membership. It is rare that an applicant is turned down, but it has happened in the past for various reasons. After the vote is counted, you will be asked to return to the meeting room and will be advised of the outcome of the vote. If accepted, you will be then welcomed as a "member" and a round of applause usually follows. Your application will be sent to the Fire Commissioners, and you will receive a physical packet with instructions. The journey has just begun! Once the Board of commissioners approve your application, you are a member and can start receiving service points by attending meetings and observing at alarm and trainings, but cannot participate at alarms or trainings until your physical results are received back to the Vestal Fire Department. Even though you have been voted in as a member, you cannot do anything other than observe. Each and every member has to undergo a thorough physical exam every two or four years, depending on the members age. The testing is totally free to all members, and includes blood work, a lung capacity test, hearing and eye tests, and cardiac testing (for those over 40 years of age). If problems are found you will be asked to see your personal physician. The results of the physical are returned to the Fire Department as "pass or fail". All other data is maintained by the doctor's office that performed the physical, and is not released to the Fire Department. Once your passed physical results re received by the Vestal Fire Department, you will be issued your proper Personal Protective Equipment (PPE). Once issue, you can then participate in alarms and trainings. You will be issued turn out gear/ personal protective equipment (PPE) from one of your stations Fire Advisory Board (FAB) officers (Asst. Chief, Captain, First Lieutenant). All equipment will be provided free of charge to all members. This equipment and its upkeep are your responsibility. It should be noted that the turn out gear is very expensive and should be treated with the utmost care and caution, your life will depend on it. Fire radio alerting equipment such as tone activated pocket pagers are issued to each firefighter. These too are provided free of charge. You may purchase a "Blue Light" or blue courtesy light that firemen are entitled to display on their vehicles. While this light imparts no special privileges to the operator of the motor vehicle (example; not stopping at red lights, speeding, etc..), it is a "courtesy light" and other motorist may or may not feel obligated to pull over to allow you to pass. Great caution should be exercised when this light is turned on, you are representing the Fire Department and should act in a safe and cautious manner while responding to an alarm. It is not, nor has it ever been, or ever implied to have been, a license to speed. Immediate suspension or dismissal from the Fire Service may be the direct result of such behavior. There are specific State required courses, specified by the role that you will be performing within the Vestal Fire Department. For the specific list of courses, see your station FAB officers. These required courses are given several times of the year, but not always in Vestal, and not always on a Monday night. You may have to travel to other parts of Broome County to attend the course, and may choose to meet at the station and car pool to the training class site with other new members.